Have you been told that you're wheat intolerant? Does it frustrate you that you can't enjoy whole grain breads like you used to? Well, don't lose hope! Did you know that by simply sprouting your grains before you grind them into flour, it changes the chemical makeup of that grain? That's right! It actually tricks your body into thinking that the grain is a vegetable, and allows it to be digested much easier. Why don't you try this simple sprouting method and start enjoying real whole grain bread again. Now, I'm not a doctor, so you'll want to start slow and experiment, but I've seen many people start enjoying sprouted bread after being wheat intolerant, and they're thriving! Looking for the tools to get you started? Check out our Bread Kit and Sprouting Supplies. Using your WonderMill Electric Mill, grind 5 cups wheat kernels, 1 cup barley, ¼ cup pinto beans, ¼ cup soy beans, ¼ cup lentils, 1 cup rye, 1/3 cup millet and 2 Vitamin C tablets (1000 mg. total) into a fine flour. Place 5 cups warm water, 3 tbsp. yeast, ½ cup honey, 1 stick of butter, 2 tbsp. salt and ½ the flour mixture in a mixing bowl, mixing until blended .Add ½ cup vital wheat gluten, 3 tbsp. Saf yeast, and gradually add in the rest of the flour, kneading to make a smooth dough, about 10 more minutes. Allow dough to rise ½ hour before shaping into 4 loaves. Rise a second time for ½ hour, and bake at 350 for 35-40 minutes. Greetings from the beautiful canyonlands of southern Utah. This week we're enjoying beautiful scenery and majestic cliffs in Zions and Bryce Canyons for one last getaway before school starts up again for the kiddos. 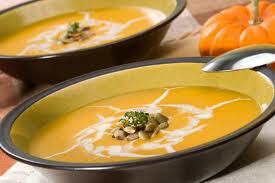 Although we're on the move, I wanted to share one of my favorite soups with you. I just made this for lunch today, and served it up with roasted chicken sandwiches. It was a hit! In a large stockpot or pressure cooker, cook the peeled squash, peeled apple, and onion with the chicken stock till tender. If using a pressure cooker, chunk all three ingredients and cook on high for 15 minutes. Transfer the mixture to a blender, and puree till smooth. Add the maple syrup, ginger, curry, and salt. Pour back into the large stockpot and add the heavy cream. Whisk till smooth, and serve topped with toasted pumpkin seeds. Heat the butter in the pressure cooker over medium heat. Add the chicken, cook until browned on both sides, and then remove to a cutting board and mince it. Add the celery, onions, and garlic to the cooker and cook, stirring, until slightly softened, about 3 minutes. Pour in the chicken broth and add the carrots, rice, and bouillon. Stir to mix, return chicken breasts, and lock the lid in place. Bring to 15psi over high heat, immediately reduce the heat to the lowest possible setting to stabilize and maintain that pressure, and cook for 5 minutes. Remove from the heat and use the natural release method to depressurize. Carefully open the lid after the pressure drops. Check out the Wondermill Special!